CHICAGO — Women met at Grant Park on Saturday to march “to the polls,” but for many Evanston residents, the journey began 13 miles north at the Davis CTA station. Linda Tate (Weinberg ’76) –– a Northwestern graduate who attended the Chicago Women’s March last year as well –– helped to organize the morning trip alongside other Indivisible Evanston leaders. 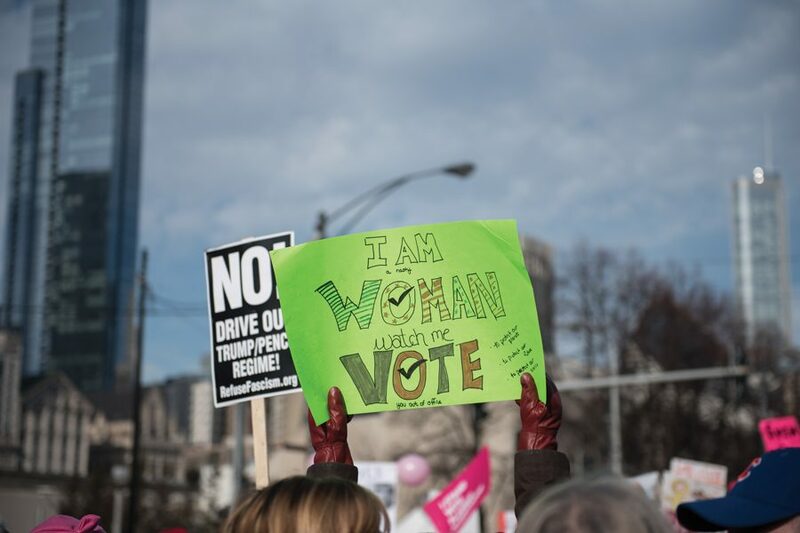 Indivisible Evanston is one of over 5,800 Indivisible groups nationwide formed in the wake of the 2016 election with the mission to resist a conservative agenda on local, state and national levels. Indivisible is comprised of local groups working to defeat the Trump agenda, elect progressive leaders and realize bold progressive policies, according to their website. Tate said the group is currently addressing issues with voter rolls as midterm elections approach. An estimated crowd of 300,000 rallied at Chicago’s second annual Women’s March at Grant Park in anticipation for November’s midterms. The reported crowd exceeded last year’s estimated turnout of 250,000 from the day after the inauguration of President Donald Trump. Evanston fire chaplin David Jones –– who was one of two men in Indivisible Evanston’s group of about 20 people –– said this year’s crowd proved that last year was not a “anomaly.” He added that a lot of people are still motivated to make political changes. Tate and other members of Indivisible Evanston joined a sea of the event’s signature pink knit hats in the park, where crowds began gathering before the rally area opened. Music and chants such as, “This is what democracy looks like” and “I believe that we will win” echoed from the event’s center stage. Indivisible Evanston member Kathleen Johnson carried a sign that said “Our children are watching!! VOTE” as she and the Chicago crowd navigated the route from Grant Park to Federal Plaza. But Tate said this year’s march was not about being angry. She said she saw it as a “ray of hope” going into a future, with less apathy toward voting. Rachel Heuman also traveled from Evanston to bring attention to the various young organizers’ who are fighting deportation. Heuman represented the Immigrant Advocacy Project –– a local group working to reform immigration. Group members collaborate with organizations such as the Illinois Coalition for Immigrant and Refugee Rights to help share information and alert people who face deportation.